What if you could get to the end of this week and feel like, Wow, that was a great week? And what if you could do that 30, 40, 50 times a year? That would be a damn good year. The following exercise outlines the most powerful practice I know to change the course of your life, focus on what’s most important to you, and tap into Flow as often as possible. Creating powerful and motivating plans that resonate with your core beliefs and then, of course, acting on them, is fundamental to keeping your Pilot Fire burning hot. If you get nothing else from this site, make a firm practice of making a Week’s Plan, every week. Below is an example from one of my students taking the Ten Lessons for Designing a Balanced Life. As a young artist, she struggled to stay focused in her different roles making money, making art, and being the girlfriend she wanted to be. Learning to take small steps every week is both the key and the treasure. One Week’s Plan looked like this. It might not look like much, at first, but a close look shows her craft. She’s taking care of her body, she’s focusing on one particular art project, she’s making sure she’s alert at her day job by sleeping right, she’s setting up a surprise date with her boyfriend by getting free tickets to a great show. And look, she’s already made a small step toward preparing for tax day, a small step that will make a big difference to her peace of mind. This looks like a great week. The process for making a Week’s Plan only takes about 20 minutes, even if you don’t have a perfect foundation of clearly defined roles and goals. NOTE: If you haven’t figured out your roles then, in preparation, take a few minutes now to write down the roles you play in your life. For example: Father, Sale Manager, Writer, Sister, Doctor, Design Engineer, Menu Planner, Dog Walker, Entrepreneur, Poet. Briefly defined, roles are unique when you identify them with different motivations and behaviors. A Father behaves differently than a Fishing Buddy. In your job you probably have several hats you wear, so include those in your list. 1. Pause and Reflect. How’d it go last week? On a separate sheet of paper, jot down a few reflections about some of your roles and how you feel you acted in them last week. Then chuck that piece of paper. That was last week. Take a few deep breathes, let your brain have some oxygen, maybe wave your arms around and sing a short aria. The point is to connect to your body and get out of your head for a minute. Now, look at that list of roles again. And reflect on what they mean to you at a deep level. Which ones beg for more skills? Which one makes you tired? Are you neglecting any of them? 3. Do it. This week, prioritize every day so that you pay attention to those goals. The treasure you will dig from a finely crafted Week’s Plan is incredibly valuable, and like I said, I believe this is the most important practice for making a life you believe in. Of course, the gold comes from making powerful roles, inspiring goals, and great plans. This is a start. If you like this idea you can download a cheat sheet to help you build this habit. 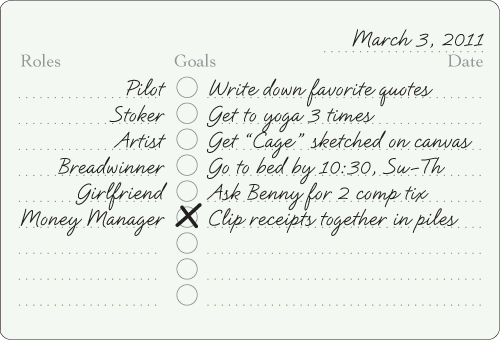 You can also find a printable pocket planner here. P.S. Feel free to let us know. What are your plans this week?